The Canary Islands was named for the dog population, from the Latin “canarius” and became the name for a species of yellow birds. On top of this the Canary Islands is a recognized paradise for flora and fauna. So you might think when you hear whistling penetrating the air from the nearby gorges and summits that animals are surrounding you. Except this whistling noise is from a human population, a dwindling numbers of shepherds whistling to communicate outside the normal range of spoken languages. Theirs is called Silbo Gomero from La Gomera, one of seven islands that compose the African archipelago. The sing-song language’s peculiar existence depends on its preservation, most endangered in 1950 when only 50 speakers were accounted for. Of late, the preservation of wildlife in these bucolic tourist traps is of equal importance as this unique piece of heritage. Indeed, 1999 marked the year when learning Silbo was made mandatory in primary schools by the Canarian government. The language owes the policy its revival, despite strong interest in the mid twentieth century by academics, notably Classe (who became a whistler himself). First documented by De Bethancourt in 1402, Silbo was originally spoken by Guanches, a branch of Berbers living in the Canaries, who would in the same year witness their islands become a Spanish colony, and their population die out. In 1891 Lajard observed that Spanish words had replaced Berber words in Silbo. More than a century later, Rialland would write that besides herding, whistling over long distances contributed to defend the colony militarily. However her main work along with Trujillo and Meyer was deciphering the phonetics and modeling Silbo with spectrograms. The language has infinite possibilities and is not merely whistled codes as one might assume. While Trujillo claimed that only two vowels and four consonants existed in Silbo, Meyer found all five vowels in the whistled speech along with a plethora of consonants. He notes that vowels are whistled at relative frequencies; the highest being the [i], and then [e], [a], [o], [u] similar to how they are spoken aloud. The last two, [o] and [u] evolve at similar frequencies but since [u] is somewhat rare in Spanish it does not cause too much confusion. The consonants are created by interruptions in the stream of sound or modulations in the vocalic heights. For example the [p], [t], and [k] are a drastic reduction in amplitude which sounds like an interruption. Moreover, according to Meyer’s analysis, many [r] and [l] sounds are interchangeable prompting the listener to use context to understand the meaning. Interestingly, even Spanish accentuations are reproduced in Silbo by elongating the vowel or elevating the pitch and amplitude slightly. This intonation is also used for question marks and the Castilian letter eɲe. The reason whistled languages have limitations and sounds that coincide with others is related to a human’s whistling capability. First is the fact that whistling under 1000hz is very difficult. Also, nasal intonations are challenging because opening up the naval cavity reduces the air flow. Finally it is difficult to surpass the range of one octave in a single sentence. Yet Silbo is the only whistled language that succeeds in doing so, the language’s entire range being 0.9 to 3.8 megahertz. While vocabulary cannot be shown in this article, Rialland describes the letter [a] being used by itself at the beginning of sentences for listeners to determine at which frequency the conversation will start and to who it will be addressed. So if you whistle the [a] and the name of a person you have already begun a conversation in Silbo. Luckily, there are numerous websites and other resources that display the spectrograms of certain Spanish words for you to potentially practice and learn vocabulary. 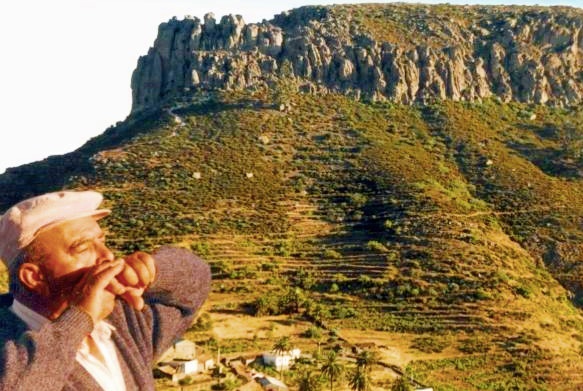 It is likely the most publicized of the whistled languages due to the research conducted and the UNESCO protection of La Gomera island. And remember, when the island becomes your next travel destination, don’t expect the songs to be anything else than instrumentals!